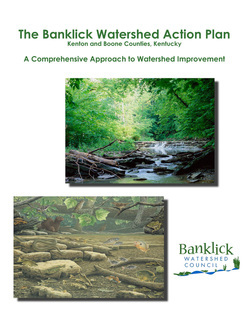 Banklick Watershed Action Plan is the framework for our activities to improve the Banklick Creek and its tributaries. With this plan, the Banklick Watershed Council (BWC) is eligible for receiving 319(h) funds, which are available to agencies with approved plans for improving a watershed. Bacteria - Possible sources include sewer overflows, failing septic systems, agricultural runoff and pet waste. Sediment - Construction site runoff? Nope. The source of most sediment in NKY's streams is erosion of the actual streambank itself, due to too much water and too high of stream velocities. Nutrients - Fertilizer use and sewer overflows. Geographic Focus Area. The Banklick Watershed is a large area. Due to the commitment of Sanitation District No. 1 (SD1) in the lower portions of the watershed to remediate point source pollution and improve water quality, our action plan calls out a “focus area” comprised of the upper five sub-watersheds. We are focusing on the area where SD1 is not already investing large amounts of management controls. Project Areas. Four types of projects were identified in The Plan. Learn more about the Projects. The plan was developed to guide the Banklick Watershed Council and all its partners in watershed improvement efforts, but it is further hoped that it will stimulate watershed residents, businesses, and others to join in those efforts. The intent of the BWC's plan is to identify a plan of action to restore and protect the water quality of the Banklick Watershed. While watershed plans are dynamic and evolving, there are four main project areas of The Plan: preserving and protecting the riparian corridor, increasing infiltration of stormwater runoff, repairing failing septic systems, and reducing livestock impacts to streams. These projects are implemented with the financial support of the Environmental Protection Agency’s 319(h) grant and donations from community members. Conservation Land Acquisition. Land conservation is a key tool to filtering runoff of pollutants before entering our waterways. It helps to preserve the tree canopy and vegetative filter along stream corridors (riparian zone). Learn more about BWC's conservation land program. Stormwater Infiltration. Work to retrofit existing stormwater management features to increase retention and infiltration. Proper stormwater management is essential to reduce flooding, prevent erosion and help to filter out pollutants carried in stormwater runoff. Learn more about BWC's stormwater program. Septic Repair/Replacement. Banklick Creek is polluted with significant amounts of silt, agricultural waste (manure run-off), and sewage. To help reduce water pollution, the Banklick Creek Watershed Council has grant funds available to repair failing septic systems in our area. Learn more about this program. Pasture Management. Livestock can have a significant impact on the amount of bacteria in our waterways. Learn more about pasture management efforts.